So you are an artist trying to make online sales? Most artists are not online marketing experts. I sure know I’m not. But I have done quite a bit of research on marketing and SEO tactics and have found some things that work for me as an artist. These are not horribly time consuming tasks and are definitely worth it if you want to be more effective in selling your work online. What if I told you that a mailing list could make all the difference with your online sales? With online services like Mailchimp, it is easier than ever to start one. But why would you need a mailing list? Imagine if next month, Facebook, Twitter, and your other favorite social media of choice ceased to exist. All of your followers and fans, lost, with no real way of staying in contact with them. With an email list, you will have direct access to your fans. Only add people who have given you explicit permission to do so. Create a sign up form that you can embed to your Facebook, website, etc. when you send an email to your followers, don’t try selling something every time. Give them an update or behind the scenes look at your latest project. Did you know that using Mailchimp, you can embed a pop up form that appears when your visitors are browsing your site? Within a day of adding this integration I saw that it was actually working. Currently, 13% of my subscribers signed up via this integration. It isn’t the main source but it definitely does help encourage more people to sign up who might not have if they weren’t prompted to. Another thing that Mailchimp offers is landing pages. If you are running a marketing campaign you can create a page through Mailchimp that asks users to join your mailing list while also giving them information on your current sale or giveaway. The landing page is not part of your website which is great for any short-term campaigns. Facebook ads are a great way to gain new followers. Your first ad should not be something you are trying to sell. People who don’t know you or your brand will not buy something just because they saw an ad for it. Something you can do first is run a small giveaway. 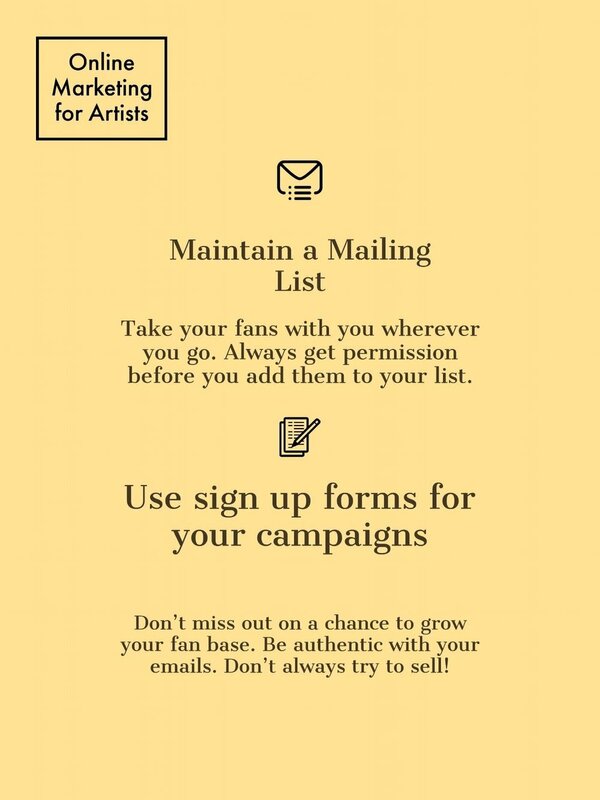 You can make the rules for entry that they like your page and sign up for your mailing list. Once you have a winner, you can email them and ask for their mailing address for you to send the item. This is a great chance to reach out to those who have not won! Offer them a discount with an expiration code. It is a great way to thank those who took the time to enter in the drawing! I recently paid for an ad requesting website clicks for $7. I only got two website clicks before my ad ended. However, I made another ad asking for post likes. That one I paid $5 that spread across three days. I reached 299 people and got 23 post engagements. Once someone likes your post, facebook lets you send them a request to like your page. I invited everyone who had liked the post and some of them converted into followers. In this case, boosting a single post was much more successful than paying for page clicks. After you have a good amount of leads, you can run another ad to your current followers letting them know of your new item for sale! People who already are familiar with your brand will be more likely to purchase something. You can upload your mailing list to the facebook ad and it will show your ad to their profiles. Using your list, Facebook can target lookalike audiences. Facebook ads take a lot of testing to get right. Play around with different ways to promote your posts and see what works best for your brand. The first thing you need is a mailing list and you need to find ways to continuously grow it while sending interesting and meaningful emails to your customers. Built in forms on your website will encourage visitors to sign up for updates and discounts. Once you have all of this information you can run a facebook ad directed towards your mailing list and look alike audiences. Go out there and build your list!